Sylvester Stallone at the Residenza di Pipette Hotel in Rome. Photo: Magnus Sundholm för the HFPA. In early June of 2007, Los Angeles County Sheriff Lee Baca was making headlines in the news because of his role in the sensational “Paris Hilton goes to jail” story that was all over the media. This incident started a flurry of allegations that Sheriff Baca gave special and preferential treatment to the stars and celebrities of Los Angeles County. In one article that was published on the web, it was alleged that Sheriff Baca had issued concealed carry weapons permits (CCW) to Hollywood stars such as Sylvester Stallone and Ben Affleck. The rumor that Sylvester Stallone was issued a CCW permit struck my interest as I had recently been made aware that he had attended a Los Angeles event sponsored by the Brady Center to Prevent Gun Violence. The “Brady Bunch”, as they are commonly referred to by gun-rights advocates, are one of the most well known organizations that are lobbying to take away our rights as lawful gun owners. I was also learning that Stallone had been quoted in the past saying some very anti-gun statements, even advocating door to door gun confiscations! I found all of this terribly hypocritical. Stallone at the Brady Center sponsored “Stand Up for a Safe America” event in Los Angeles, CA on Sunday, November 22nd. How can someone that has made millions of dollars in films that glorify gun violence and killing, movies such as First Blood, Rambo, Cobra, and Judge Dredd just to name a few, be so hypocritical on the issue of the Second Amendment and gun ownership rights. Can someone that is so clearly supporting the Brady Bunch and has called for door-to-door gun confiscations actually own guns himself and have a CCW permit? Not to mention the special treatment he would have received in order to get a CCW permit in a county where it is nearly impossible to get one. I was encouraged by members of my gun forum community to try to obtain a copy of Stallone’s CCW application through the California Public Records Act. With help on how to word the request to obtain a copy of Stallones CCW application I sent my first letter to Sheriff Leroy D. Baca of the Los Angeles Sheriff’s Department. As advised, I sent this letter via certified mail so that I could track when the letter was received at their office and also so they could not deny having received the letter. The purpose of this letter is to make a request to your department for information pursuant to the California Public Records Act (PRA), GOVT. CODE §§ 6250 – 6276.48. According to the PRA, records of county government entities, including sheriffs’ departments, are generally public records. According to the CBS v Block ruling (see attached), Concealed Carry of Weapons (CCW) application, issuance and renewal records are public records for the purposes of §§ 6250 – 6276.48. Information to be made available includes “any writing, picture, sound, or symbol, whether paper,…, magnetic or other media.” (§ 6252(e)) Please also include a color copy of the photograph from Mr. Stallone’s CCW application. Finally, please include copies of any letters, such as approval letters or renewal letters, which related to Mr. Stallone’s CCW application, either from your office to Mr. Stallone, or received by your office from Mr. Stallone. In their first response, written by Undersheriff Larry L. Waldie, the Sheriff’s Department tried to give me an evasive answer. Rather than providing me with a copy of the CCW application which I clearly requested they merely replied that “for your information, Mr. Stallone does not have a concealed weapons license”. Well ok, that may be true but I didn’t ask if he currently has a CCW license, I asked for a copy of his application. I wasn’t going to give up so easily. With the advice of others, I decided to write another letter of request – this time just to get acknowledgement of whether he has ever applied for a CCW permit and, if so, on what dates. Armed with confirmation that he had indeed applied for and been granted a CCW permit in Los Angeles County, I wrote another letter asking specifically for a copy of Stallone’s CCW application that was submitted to them on September 29, 2004. Thank you for your response to my letter of June 25, 2007 in which I requested information on whether or not Mr. Sylvester Stallone had applied for a CCW permit and the date of the application. Now that I have confirmation that Mr. Stallone did indeed apply for a CCW permit on September 29, 2004 and that a permit was issued on November 30, 2004, I wish to again repeat my original request for a copy of Mr. Sylvester Stallone’s CCW application which was submitted on September 29, 2004. Please include pages 3 through 13 (inclusive) of the application. 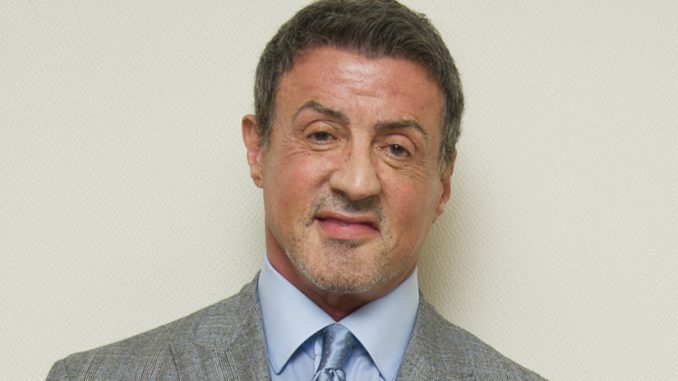 Please also include a copy of the photograph from Mr. Stallone’s CCW application. On August 24, 2007 I receive a large envelope in the mail from the Los Angeles County Sheriff’s Department. Inside of it is a copy of Sylvester Stallone’s CCW application – well, some of it at least. All of his personal information such as SSN, address, and phone numbers have been redacted but also is his entire good cause statement! On page 14 of the application Stallone signed a statement found on all CCW applications that states “Notwithstanding any other provision of law and pursuant to the Public Records Act (Government Code section 6250 et seq. ), I understand that information contained in this application may be a matter of public record and shall be made available upon request or court order.” I guess that doesn’t apply to the rich and famous Hollywood-elite crowd. Below you will find scans of all the relevant pages of Stallones CCW application. I only include pages where Stallone actually supplies information and didn’t bother with the pages that just contain text of the penal code and other information.